The various surviving editions may sometimes change the order of essays or melodies in some places, or have one or more apparent omissions, but in general they all copy one or the other of the two versions identified above, with that latter being largely an expansion and revision of the former. Specifically, the melodies in the latter are sometimes identical to those in the earlier publication, but in many cases they have either small or major revisions or, in a few cases, versions that seem to be a new melody. Because of the similarities, however, this website largely combines its commentary for all the examined surviving versions. Awakened Minds (醒心集 Xing Xin Ji; tentative interpretation, awaiting translation of lyrics). At present, however, very few people have published or recorded reconstructions of melodies directly from any of the surviving editions.11 Perhaps this is for some of the same reasons that I have done so little with this handbook. The longer melodies are particularly elusive. My personal examination has found what seem to me many errors and/or non-idiomatic passages.12 In addition there are some prominent finger techniques that are not clearly covered in the tablature explanations.13 For me another important factor discouraging me from further reconstruction of melodies in this handbook has also been that I have not had a singer with whom to work on qin songs (further comment). 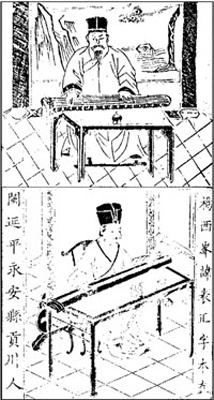 Treating the various Yang Biaozheng handbooks as one means that the commentary on his repertoire is mostly included here under the present edition, published in 1585. As mentioned, it has 105 melodies, and no other versions are known to have material associated with Yang Biaozheng that is not in this edition. It is also the only one indexed in Zha Fuxi's Guide. Further regarding the pieces here that occur in differing versions in earlier handbooks, here many of these seem to have music very different from that of the earlier versions of the same title. In some cases this may be mostly due to their having been adapted from instrumental melodies into qin songs. Some of these adaptations seem to come from the aforementioned Taigu Yiyin of 1511. See also the 1573 introduction and ToC. In Qinqu Jicheng, Vol. 4; Beijing, Zhonghua Shuju Chuban Faxing, 1982. Yang Biaozheng (15489.270; Bio/873), style name 西峰 Xifeng (or: 西峰山人 Xifeng Shanren), was from 永安 Yong'an, in the 延平 Yanping district of central Fujian province. He is not in Xu Jian's Outline History and the dictionary entries are short. Van Gulik, pp. 76-79, has Yang's 彈琴雜說 Miscellaneous Remarks on Playing the Qin as well as some of his rules for when and when not to play qin, but has only sketchy biographical information (p. 185). Since the handbook was printed in Nanjing, one can speculate that at some stage Yang moved there from Fujian. This leaves open the question of whether he brought a Fujian style of qin songs to Nanjing, or developed his style after the move. It would be interesting to compare his music with that of Yang Lun as found in Zhenchuan Zhengzong Qinpu, printed only a few years later, also in Nanjing. There seems in fact to be more connection than what is suggested by Van Gulik. Top image 1573, bottom image 1585 (IV/263). The latter of the listings below may be unofficial titles rather than separate editions. All have 6 folios and 68 melodies (3 + 65). In the margin of each folio page are the words "對音捷要琴譜 Duiyin Jieyao Qinpu". This volume, found on such sites as catalog.digitalarchives.tw and shuge.org (which do not say where the original is kept), has also been reproduced in the 叢書 compendium "域外漢籍珍本文庫". The original copy is apparently in the 日本國會圖書館 Kokkai Toshokan (Japanese National Diet Library; compare the National Archives of Japan, formerly the Naikaku Bunko). It has a seal of the Japanese imperial library (帝國圖書館) at front along with old library reference numbers and other seals, one having a date (大正4.12.1寄贈: "donated Taisho 4": 1915/6). The text first refers to itself as "太古琴 Taigu Qin", then as "琴譜真傳 Qinpu Zhenchuan". The full title, above, does not appear until after the prefaces (E45). Paragraph 1 of the Preface in QQJC, Vol. IV (p. I) also mentions this title, though without the words "Xinkan". A copy in the National Library, Taiwan, where it can be viewed on microfilm. It has the same title and almost identical content as the above (notable differences include the absence of seals on the first page and the inclusion of two images not in the online facsimile edition). The catalogue says it was "金陵書肆唐富春刊本 a volume from the Nanjing bookstore Tang Fu Chun". The Catalogues of the Library of Congress and the Harvard-Yenching Institute list a copy under this title as well as the above title; it is not clear whether these are two items or one, or whether they are actually in their own collections. All have 10 folios and 105 melodies (3+102). In the margin of each folio page are the words "西峯重修琴譜 Xifeng Chongxiu Qinpu". However, these all seem generally to be referred to by the title 重修真傳琴譜 Chongxiu Zhenchuan Qinpu, although that is a short form that never appears as such on any of the original editions. This is the volume in Qinqu Jicheng, which reprinted a copy then belonging to 汪孟舒 Wang Mengshu. As in the other later/longer versions so far examined, it has the full title 重修正文對音捷要真傳琴譜大全 Chongxiu Zhengwen Duiyin Jieyao Zhenchuan Qinpu Daquan, but this is first written after the opening prefaces, i.e., with Folio I (QQJC IV/264). Two columns after this title the publication place is said to be 金陵三山街綉谷對溪書坊唐富春梓 Jinling Sanshan Jie Xiukuduixi Shufang Tang Fuchun Zi. After the last melody the date is given as 萬曆乙酉歲孟虬吉旦 (1585) and but the publication place is slightly different: 金陵三山街富春堂梓 Jinling Sanshan Jie Fuchun Tang. There are then two more essays. This volume thus seems to be the same as the volume in Siku Quanshu Cunmu Congshu (next). This seems to be the same as the volume just listed. Dated 萬曆十三年 (1585), it is the one actually published in Siku Quanshu Cunmu Congshu, Vol. 子 73. which says it was "唐富春刻積修堂印本 Tang Fu Chun Ke Jixiutang Yinben". This volume, which seems to have "重修正文對音 Chongxiu Zhengwen Duiyin" as its subtitle, says the original was a 積秀堂藏版 Jixiutang Zangben; it has been published in Xuxiu Siku Quanshu Cunmu Congshu, Vol. 1092 (which seems to list it as 重修正文對音捷要真傳琴譜大全 Chongxiu Zhengwen Duiyin Jieyao Zhenchuan Qinpu Daquan!). Its content seems to be virtually identical to that of the previous, just rearranging some pages (e.g., after the opening preface it has three pages of essays that the other edition placed at the end). Presumably similar to the above, though the comments below by Van Gulik suggest there may have been some that were different. See Van Gulik, Lore of the Chinese Lute, p. 185 ("1503 [sic]. Imperial Catalogue, ch. 114, leaf 7 verso"); compare above and Qinpu Hebi (as in Wenyuange Siku Quanshi 839?). Van Gulik made useful translations from this handbook, which he calls Qinpu Hebi Daquan, but his comments about it are confusing and, in some places, apparently inaccurate (further detail). Liu's prefaces to the short and long editions are virtually identical (both beginning "夫太古遺音廼樂中最清聲...."), but the date given at the end of the one in the short version is 萬曆改元臘 (1573, the "return to a new original year" of Wanli, i.e., the second year of his reign, which lasted from 1572-1619), while in the long edition the date is given as 萬曆乙酉歲 (1585). In the preface Liu compares Yang's handbook to that of Xi Xian. 7. Publisher: Tang Fu Chun or Fu Chun Tang? Perhaps a man named Tang Fuchun later named his store Fuchun Tang. There is further comment under Zha Fuxi's introduction. 18 new titles for what seem to be 16 new melodies; the numbered links below are to entries in the 1585 ToC for these 16 respective new melodies; also given are links to the 1573 ToC for the 9 of these that actually occur first in that edition. On the other hand Chongxiu Zhenchuan Qinpu does also seem to have some old titles for what may be completely new melodies (see, e.g., its Zhao Yin). However, I have not yet examined the handbook thoroughly enough to know which pieces might fit this category. First Memorial on Dispatching the Troops (前出師表 Qian Chu Shi Biao; transcription incomplete; note values tentative). Mount Tiantai Prelude (天台引 Tiantai Yin; transcription incomplete). For a long time the only melodies I had learned from Chongxiu Zhenchuan Qinpu were the three preludes at the beginning of the melody section, elsewhere grouped under a single title Cao Man Yin; I often use these to teach beginners. In 2006 I did a reconstruction of the 1585 Xiang Si Qu (#38), in 2015 added the 1573 version, then in 2016 reconstructed Shi Yin and the two related versions of Xing Tan Yin. Xiang Si Qu is the earliest known version of the melody which developed later into Gu Qin Yin, still (or again) played today. I began with the 1585 version, not knowing the 1573 one was significantly different. This proved to be quite straight-forward, with few problems. When I discovered that the 1573 version was quite different I reconstructed that one, then recording it and several later related melodies, noting the various differences and thus, of course, raising more questions. Regarding the "incompleted reconstructions", this refers to the fact that I have begun transcriptions for several more pieces, or simply tried to play them from the tablature, but for these I usually have not gotten very far. The first problem is often translating the texts. Then either I have problems figuring out the note values (sometimes because of mistakes or unexplained terms in the tablature or because the pieces are too short for me to get a feeling for them), or if I have worked out note values I am not satisfied with the result. Perhaps if I were working with a singer that would change. R.H. Van Gulik, Lore of the Chinese Lute, p. 185, describes what he calls Yang Biaozheng's 琴譜合璧大全 Qinpu Hebi Daquan (a "bi" is a piece of jade, but here the suggestion is paired music and lyrics) as follows (note that "Imperial Catalogue, ch. 114" is "Siku Quanshu 114", which includes the 琴譜大全 Qinpu Daquan listed above): "(N)ot divided into chs., compiler Yang Piao-chung; first preface anonymous, and undated; second preface by Liu Yü, dated 1503 (sic). Imperial Catalogue, ch. 114, leaf 7 verso....(P)ublished by a literatus of very low scholarly standing. The tunes are given in a kind of simplified version, and all -- as indicated by ho-pi in the title -- are accompanied by words. This text of the songs must be of the editor's own making, for it is written in a queer mixture of literary language and colloquial. The text is interspersed with refrains like ya-ya, ai-ya, such as are used only in Chinese popular music. Yet this handbook seems to have been very popular; it was printed in an extraordinarily great number of copies, so that even now it can esily be bought. It saw a second edition, which can be distinguished from the first by the fact that in the second one the picture after the prefaces (representing the author playing the [qin]) is missing." Van Gulik's comments on the text being "interspersed with refrains like ya-ya, ai-ya" is somewhat puzzling, as I have not noted this (compare Qinpu Hebi). His confusion on the date is similarly puzzling. "....clumsily written..., one of the introductory chapters of (the present handbook)....compiled by Yang Biaozheng, a professional (qin) expert of very low scholarly standing; evidently he has difficulty in expressing his thoughts freely in the literary medium, and often relapses into colloquial expresssions. Still, as he was a clever musician, who knew how to recast the famous old tunes in a simpler but yet charming form (such as might be executed even by mediocre [qin] players, and because of the extraordinarily great number of copies in which his book was printed, it was one of the most popular handbooks of the Ming period. Even now copies can be easily purchased in Chinese and Japanese bookshops. The meaning of the (qin) is restraining the false and bringing back to the right, in order to harmonize the heart of man. Therefore the Holy Sages made the (qin) for regulating their persons and for nurturing the harmony of their emotions. Restraining wanton extravagance, and rejecting excessive luxury, one should cherish the music of the Holy Sages, that thereby one may learn the mysterious wonder of their souls, and so rejoice in their thoughts. Whosoever plays the (qin) must choose a pure dwelling or a spacious hall; or he must ascend a storied building; or he may tarry by trees and rocks, or climb a steep cliff or again he may ramble along the verdant bank of a stream or he may dwell in a monastic abode. When the two essences of nature are balanced, lofty and clear, on a night when there is a cool breeze and a brilliant moon, he must burn incense in a quiet abode. He must steady his heart, introvert his thoughts, so that soul and body are in complete harmony. Then only shall his soul communicate with the spirit of Nature, and he shall be in harmony with the wonderful Way. If there is not present a man who understands (the inner meaning of) music, one had better play to the cool breeze and to the brilliant moon, to the dark-green pines and quaintly-shaped stones, to an ape of the mountain tops or to an old crane. Then one naturally grasps the inner meaning of this music. When one knows its meaning, one understands its tendency; when one understands its tendency then one may (truly) understand the music. Though the music be technically well executed, if its tendency is not understaood, what benefit shall it give? It is nothing more than a big noise that avails nothing. In the first place one's personality should be aloof (from all material things), and still elegant, and one's bearing must be pure. Further, the finger technique should be correct, the touch should be correct, the mouth should be bearded and the belly full of ink (i.e., one should be a mature literatus). Only when these six qualities are all provided for may one take part in the way of the (qin). If one wishes to play the (qin), one should first see that one is dressed correctly: either a gown of crane-feathers, or a ceremonial robe. (For) only if one knows the appearance of the Holy Sages shall one be able to appreciate their instrument (i.e., the [qin]). Next one should wash the hands, burn incense; then one should approach the table and lay the (qin) on its stand. One should be seated opposite the fifth stud in such a way that this stud faces the heart of the player. Then both hands should be lifted. The heart is regulated, the body is steadied, it does not incline to the right or left, or sway forward or backward. The feet should be planted on the earth like the stance of an archer. One should take care that the right hand touches the correct string, and that the movements of the left hand are correct. The hands should be kept low and evenly balanced; they should not be raised unduly high. Left and right hand should touch the strings on the places indicated by the studs (in such a way that) the right hand is near the bridge; the nails of the hand should not be long, but just about the breadth of one grain. The strings should be touched half by the flesh and half by the nail; then the sound is not dry, but clear and rich. (The left hand) should press the board as if it would penetrate the wood. The outward and inward touch of the thumb, index and middle finger of the right hand, the vibrato, vibrato ritardando of the left hand, and the quick movements of the right hand over one or more strings, all these touches should be fully expressed, they should not be executed loosely and hastily, to give the impression of a light and flowing style. If one aims at specious dexterity and playing to the eye of the public, one had better leave the (qin) alone and take to acting; if one aims at producing ornate tones that captivate the ear, one had better drop the (qin) and take to the (zheng). The greatest emphasis must be laid on (distinguishing between) the light and heavy, the swift and slow touch, and between the decrescendo and crescendo. When one's self is naturally aloof and earnest, then one shall correspond to the Mystery of the Way, and one's soul shall melt together with the Way. Therefore it is said that successfully executing music is not caused by the hands, but by the heart, that music is not produced by notes, but by the Way. When one does not strive to express music in tones, but lets it come naturally, then one may experience the Harmony of Heaven and Earth, then one may be in communication with the virtue of the University Spirit. Also it is said: The vibrato, the vibrato ritardando, the ascending and the descending attack of the left hand, the light or the heavy, the swift or the slow touch of the right hand, all these things can hardly be explained in words. They can be understood only by a man of learning. See also Van Gulik's comments on Yang Lun Taigu Yiyin. It is somewhat odd that Van Gulik apparently failed to note that many of Yang Biaozheng's melodies use for lyrics famous old poems, and some of Yang Lun's melodies use refrains from popular music. Perhaps this says something about the editions he used, or perhaps he confused the two handbooks. As for his comments on the music itself, he does not mention where he heard them and certainly did not play them himself. Other than my own, reconstructions from Chongxiu Zhenchuan Qinpu are mostly by 王迪 Wang Di. However, to my knowledge none has been recorded and the transcriptions are often difficult to follow. There are also at least two (清江引 Xing Tan Yin and 清江引 Qing Jiang Yin) in 薄克禮、張子盛主編：中國古代琴歌精華校譯 Bo Keli and Zhang Zisheng, Comparative Edition of Essential Chinese Ancient Qin Songs. Wang Di's 琴歌 Qin Ge (p.26) also transcribes (but does not copy the tablature for) five melodies said to be from 1585; four are as above, but instead of Xing Tan Yin it transcribes the melody it calls 客至 Ke Zhi, a title not found in either the 1573 or 1583 handbooks. Nevertheless, it is especially worthy of mention because, to begin with, it pairs different lyrics to the 1573 melody 詩吟 Shi Yin (Intonation for Poetry), which in turn is in fact the same melody as Xing Tan Yin. The connection between Shi Yin and the the 1573/1585 Xing Tan Yin is particularly interesting; this is further discussed separately. Such errors might be connected to the differences that can be found between editions. Such errors can be obvious (unplayable) or they might better be called "apparent" (seemingly inappropriate notes). My work with this handbook has mostly consisted not of reconstructing the melodies, but of comparing the basics of its versions with the same melodies in earlier handbooks. Almost invariably the versions here are very different. Note that the lyrics are often the same as those found in either Zheyin Shizi Qinpu (comment) or Taigu Yiyin. For example the "Important left hand fingerings" include a "撞 zhuang", described as "急上下 quick up and down", and a "猱 nao/rou" described as "去上徽又下 go up from the inital position then back down", but many pieces do not seem to use these terms, only "上下 up down" or "卡 (short for 上下? )"; one can only guess as to how to differentiate these. My comments here can only be considered as preliminary observations as, although I have seen both the 1573 and 1585 editions, I have played only a few of the melodies. Longer melodies that are not so clearly songs may not have as much variation between editions. Reflections of the popularity of the particular melody. The latter would suggests that the short song Xiangsi Qu was quite popular: the versions I have seen in the two editions, though they have few if any mistakes, are quite different. The method of pairing words and tablature almost exclusively follows a fairly strict formula of one word per right hand stroke. The justification for this is often something like, "Confucius sang like this when he played so we should also". However, it is difficult to imagine many of the longer pieces with lyrics as actually intended for singing. Perhaps the pairing was done for idealistic reasons, perhaps the intention was only that the words be read silently or out loud while the music was playing. Sometimes the lyrics might even have been a mnemonic device to help remember the melodies. This means appeal to people that presumably conservatives such as Zhu Quan might call "the wrong sort of people." 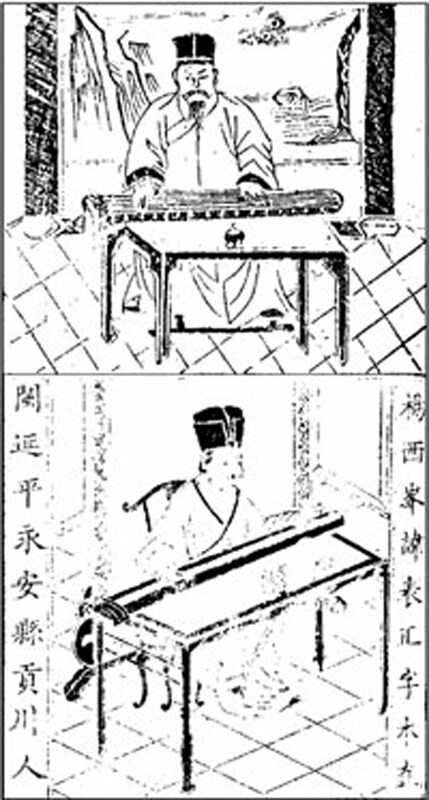 Zhu Quan in his Preface to Shen Qi Mi Pu wrote insultingly of riffraff playing the qin. He does not mention members of the merchant class, but the qin certainly had appeal to people of this class who wished to be connected to literati culture. For more on this see The Qin in Novels and Opera.